Okay, maybe I haven’t found the actual Fountain of Youth, but I came close with Neutrogena’s Rapid Wrinkle Repair products. The line includes four products: Rapid Wrinkle Repair® Serum, Rapid Wrinkle Repair® Eye Cream, and Rapid Wrinkle Repair® Moisturizer for both day (with spf 30) and night. All these products include the fastest retinol formula out on the market, as well as Glucose Complex and Hyaluronic Acid to brighten skin tone, smooth fine lines and fade wrinkles. As a huge believer of starting early, I welcomed trying this new line with open arms. My first impression of the products was how nice the scent was. Whenever I use clinical products, I expect it to be unscented. This line has a very light fresh smell to it. Then what really impressed me was how lightweight the formula was. Everything absorbed instantly, and it never made my face oily or feel heavy. 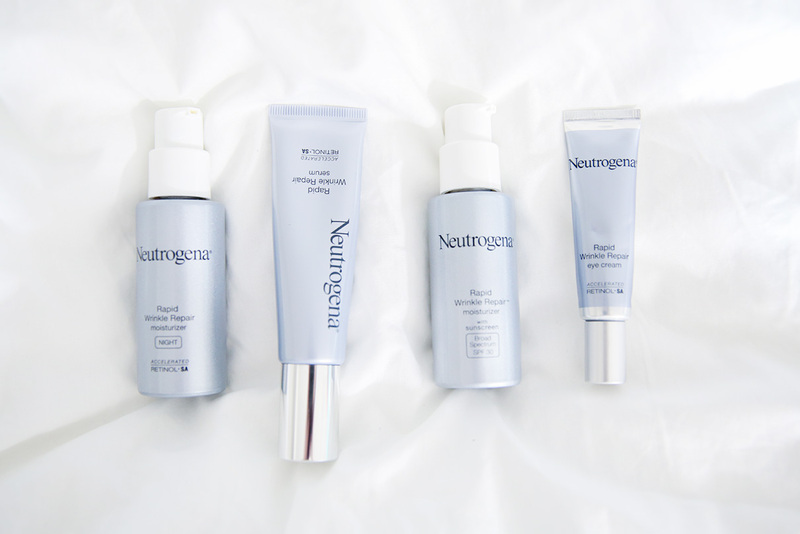 That’s my make or or break factor in skincare, and Neutrogena wins here. After a few weeks of using these products, I feel like my skin a much bouncier and brighter. Although, I have no visible aging signs like wrinkles or fine lines, you can never be too sure of what’s hidden below the surface. I just like to say, that since I’ve focused more on skincare, my face overall is in such a better place. It really does make such a difference. It’s equally as important to prevent as well as treat skin issues.